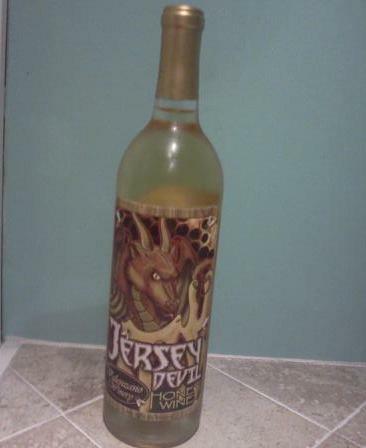 The other night I tried Jersey Devil Honey Wine, produced by the Valenzano Winery located in Shamong, New Jersey. While I never heard of the town before, apparently it’s located in the Pine Barrens, birthplace of the Jersey Devil, hence the name of the wine. As you can see in the (horrible) pic below, it has probably the coolest looking label ever, with the Armpit of America’s most famous monster (sorry, Snooki) surrounded by bees. I know we’re not supposed to judge a book by its cover, but I’m totally judging this bottle of wine by the label. With the fricken Jersey Devil AND bees, how could it not be bad? So how did does it taste? Well, it’s thick as syrup and cloyingly sweet….which is exactly how this connoisseur of fine wine likes it. Just like the Manischewitz wine I grew up with.